The goddess Athena thought she was creating a utopia. Populate the island of Thera with extraordinary men, women, and children from throughout history, and watch as the mortals forge a harmonious society based on the tenets of Plato's Republic. Meanwhile, following his famous spurning by a nymph, Athena's ever-curious brother Apollo has decided to live a mortal human life on the island, in an effort to gain a better understanding of humanity. But as both Athena and Apollo soon discover, even the Just City is susceptible to the iron law that nothing ever happens as planned. And there are sins in Paradise, mortal and divine, far graver than the everyday ones. 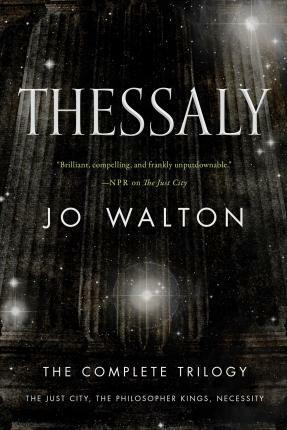 In an epic encompassing sandy Mediterranean shores and the farthest reaches of the galaxy, Victorian England and Renaissance Italy, gods and humans argue, fight, love, and most of all, learn from one another, in critically-acclaimed author Jo Walton's unique exploration of the human condition, Thessaly. JO WALTON won the Hugo and Nebula Awards in 2012 for her novel Among Others. Before that, she won the John W. Campbell Award for Best New Writer, and her novel Tooth and Claw won the World Fantasy Award in 2004. The novels of her Small Change sequence--Farthing, Ha'penny, and Half a Crown--have won acclaim ranging from national newspapers to the Romantic Times Critics' Choice Award. A native of Wales, she lives in Montreal.